Distilled water, Olive oil, Shea butter, Coconut oil, Cocoa butter, Fragrance, Activated Charcoal, Mica. Our Anise activated charcoal bar smells just like black licorice. Activated charcoal is known to help tighten and smooth skin, it is also known to help detox the skin and draw out impurities. 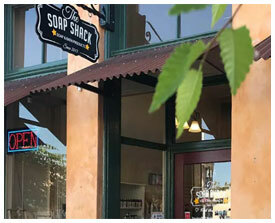 We handcraft all our soaps in small batches right in our store. We then hand cut every bar. We use only natural and organic ingredients and our special blend of skin loving oils creating a very moisturizing soap that has a nice lather but rinces off clean and leaves your skin feeling refreshed. water,, rice bran oil, olive oil, coconut oil, shea butter, cocoa butter, fragrance, activated charcoal.